90-mile long Lake Koocanusa reservoir is held back by 422 foot tall Libby Dam, located 16 miles upstream from the town of Libby. The dam provides flood protection and hydroelectric power. The lake offers a multitude of recreational opportunities including boating, fishing, lakeshore camping, and picnicking. Lake Koocanusa was completed in 1972 as a joint project between the United States and Canada in an effort to provide flood protection and to generate hydroelectric power. The Kootenai River fluctuated wildly in the spring causing flooding in Montana, Idaho and British Columbia. 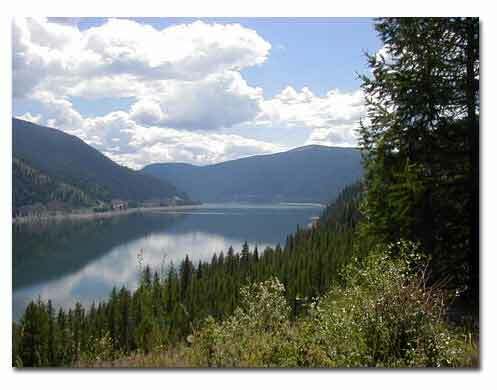 Lake Koocanusa received its name in a contest to name the Libby Dam reservoir. Alice Beers, from Rexford, Montana, combined the first three letters from KOOtenai River, and the first three letters of CANada and USA. Lake Koocanusa is home to a variety of fish species. Sport fish include rainbow trout, west slope cutthroat, brook trout, kokanee salmon (blueback), burbot (ling), whitefish and Kamloops (a strain of rainbow trout). The lake has a maximum depth of 370 feet. A valid Montana fishing license is required to fish any Montana waters. Recreation areas developed by the Corps at Libby Dam and Lake Koocanusa include a visitor center at the dam site; day-use areas; and developed, primitive and boat access campgrounds. Souse Gulch, a day-use area with picnicking, trails, boat launch, boat moorage dock, water, and restrooms is on the west bank, just upstream from Libby Dam. Several dispersed recreation sites are downstream from the dam. Alexander Creek, Dunn Creek Flats, and Blackwell Terrace offer boat access to the river, primitive camping, and excellent fishing. Souse Gulch, Alexander Creek, Dunn Creek Flats, and Blackwell Terrace are all operated by the Corps. Alexander and Blackwell have primitive boat access. Dunn Creek has the only improved launching ramp. McGillivray Campground is 7.5 miles above the dam on the west shore and provides camping units, picnic shelters, a swimming beach, rest rooms, and a boat launching ramp. On the east shore, Cripple Horse Campground, 7 miles above Libby Dam, offers camping, marina, boat launching, and picnicking facilities. Peck Gulch is 29 miles upstream from the dam and offers a boat launch, picnicking, and waterfront camping. Rexford Bench, 44 miles upstream from the dam on the east shore, has a boat ramp, moorage, trailer dump station, swimming beach, picnicking, and camping. Yarnell Island is 3 miles above the dam and is accessible only by boat. Boaters should note that there is a No Wake Speed Restriction for boats in Cripple Horse Bay within 300 feet of the dock or as buoyed. Tobacco Plains, 8 miles above the town of Rexford on the east shore of the lake, offers boat launching facilities and picnicking; Gateway, on the Canadian border, offers boat access camping only. Peck Gulch, Rexford Bench, Yarnell Islands, Tobacco Plains, and Gateway were developed by the Corps and are operated by the U.S. Forest Service. Cripple Horse Campground, jointly developed by private industry, the U.S. Forest Service, and the Corps, is operated by private industry. In 1989, Libby Dam was designated by Montana Fish, Wildlife, and Parks as an official Watchable Wildlife Area. The area consists of the Downstream Natural Area and the David Thompson Bridge below the powerhouse. Viewing opportunities abound for deer, coyotes, river otter, moose, raccoons, bald eagles, great blue heron, geese, ducks, trumpeter swans, osprey, hawks, songbirds, and gulls. 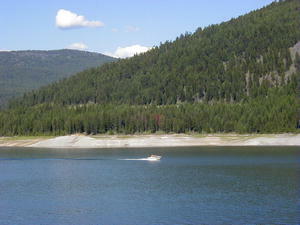 Lake Koocanusa is open for fishing year-round. A valid Montana fishing license is required to fish all Montana waters. The rainbow trout limit for the lake is 5 daily (10 in possession), with only 1 over 22 inches; the limit for brook trout is 20; and the limit for cutthroat trout is 3. The limit on Kokanee is 35 daily, 70 in possession. The limit on burbot (ling) is 5 daily and 5 in possession (the lake is closed to burbot (ling) fishing from January 15-February 28th). All page content copyright 2012. All rights reserved. Photos by LibbyMT.com unless otherwise credited. Reservoir camping graphic from US Army Corps of Engineers Libby Dam and Lake Koocanusa brochure.